Mrs Stead posed the question ‘What month is it?’, which infact was a trick question as it is Michael Morpurgo month! So we visited the library and looked at the array of texts and books we had in school. To our surprise, we had an amazing amount of his books and decided to each take one to read over the next few weeks. 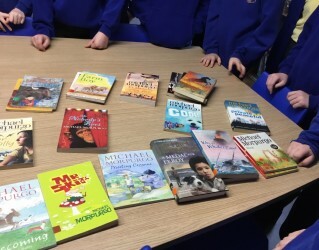 We have studied his books in guided reading but thought we would take it one step further by everyone reading a book of their choice. We read blurbs and extracts before making our choice. We can’t wait to read them and begin lots of Michael Morpurgo activities.